If necessary, contact the department at your campus that is in charge of the space outside of your store or the city to obtain permission to host the street fair. 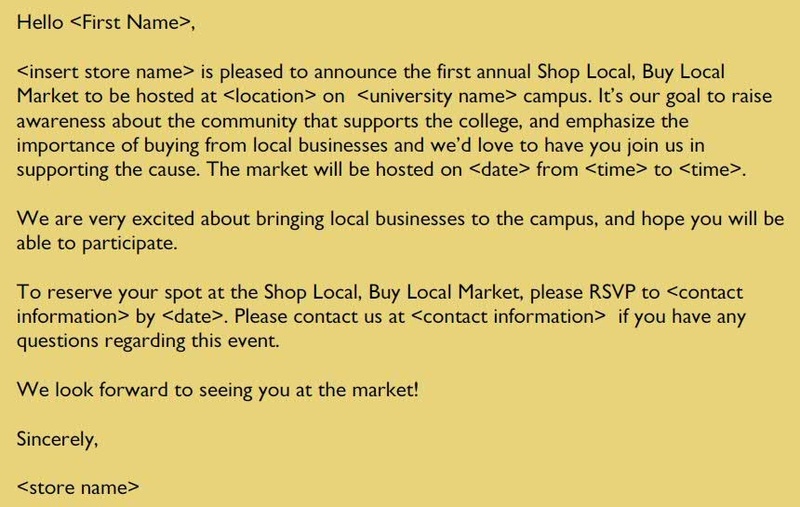 Invite businesses in and around your community to participate in the Shop Local, Buy Local Market. 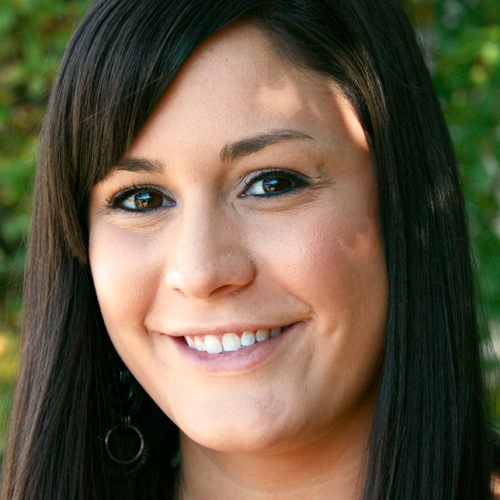 Your Chamber of Commerce is a great resource for finding prospective vendors. Contact a variety of businesses and community organizations, so there will be a diverse group on the day of the street fair. Be sure to reach out to local farmers and restaurants too, so there will be food for patrons to purchase! Word-of-mouth is a valuable tool for connecting with potential vendors, so start promoting your store’s street fair early. To make your job easier, we’ve included a customizable letter you can send to potential vendors, informing them of the event; just click the image to the right to download. Plan the layout of the fair space. If possible, ask vendors to estimate the size of the booth that they will need. If there are a variety of items to be sold, then it may help to vary the size of their areas to ensure adequate spacing. On average, an 8’ to 10’ booth space should work for most. Also, outline the time parameters for setup and tear-down, parking and other logistical information, so the event runs smoothly for the businesses you invite. If electricity or other utilities are needed, then it may be necessary to charge a fee for participating vendors to help cover your expenses. If that’s the case, be sure to clarify these details with participants. 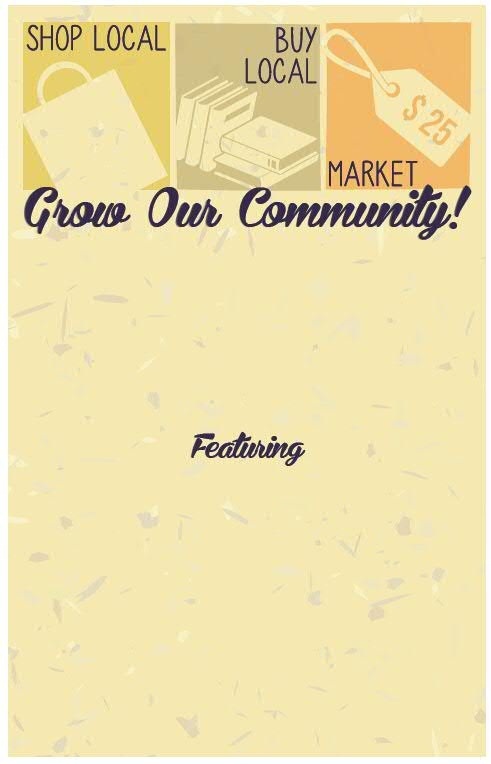 Announce the vendors attending the fair on your store’s social media sites as well as in-store and spotlight a selection of them, so students can learn more about what they have offer. Try to cross-promote as many vendors as possible. To help, we’ve designed a promotional kit that includes a customizable poster template, a Facebook Cover Photo and a Twitter background; click the image to the right to download all three. Before the event, contact local media, informing them of the Shop Local, Buy Local Market to cultivate positive PR for your store and your campus. Use our customizable press release template to simplify the process. Click here to download. On the day of the event, set up a booth of your own! This is the perfect time to clear the shelves of last season’s merchandise by offering deep discounts to patrons of the street fair. To help facilitate easy transactions, consider using MBS’ Mobile POS solutions. Talk to your Systems Sales Consultant for more information. Take pictures of the festivities and post them to your social media sites throughout the day. Keep your online audiences updated on the vendors in attendance, cool items or tasty food being sold to entice them to stop by. 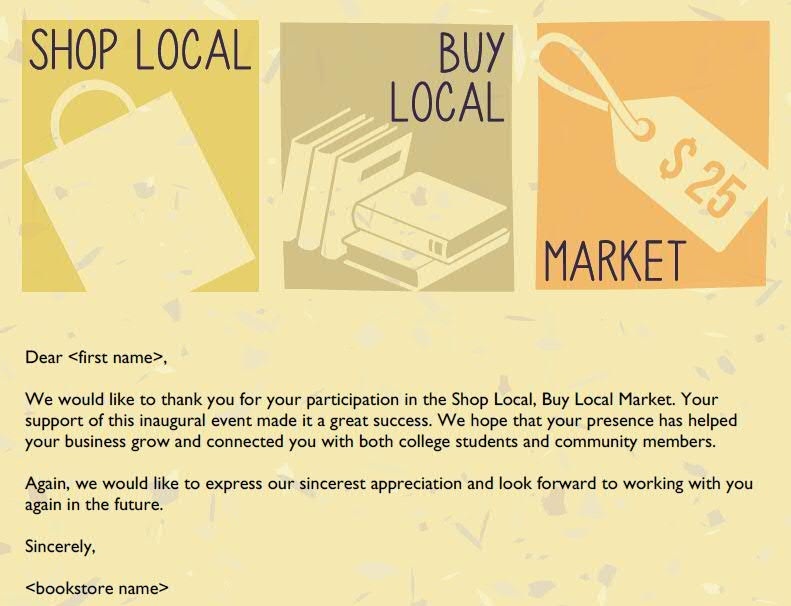 Send out thank you notes to the vendors to show your appreciation for their participation in the first (annual) Shop Local, Buy Local Market! Simply fill in the details on our customizable card template, print and mail! As with any inaugural event, evaluate it. Take notes on what worked and what didn’t, and file this information away to use when planning and executing future events. Consider sending out a short survey to students, assessing the variety of vendors, the likelihood of them making a purchase, and if they would like to see similar events in the future.